Hearts and arrows is a term marketed to consumers as a key indicator of diamond cut quality. The cut dictates the level of sparkle and fire that the diamond will exhibit. It is arguably the most important element to consider when buying a diamond. Diamonds that are poorly cut can appear to look smaller than they actually are due to the weight being hidden at the base of the stone. If the cut is too shallow light will leak out of the bottom, whereas if it is too deep the light will escape out of the side of the stone. The modern cut of a round diamond is referred to as a ‘round brilliant’. The round brilliant cut divides the diamond into 57 facets. The hearts and arrows pattern is seen on a perfectly cut stone, with ideal internal optical symmetry viewed under a special viewing mechanism called a Firescope. This starburst pattern of 8 arrows is the reflection of the crown of the diamond through the table of the diamond. 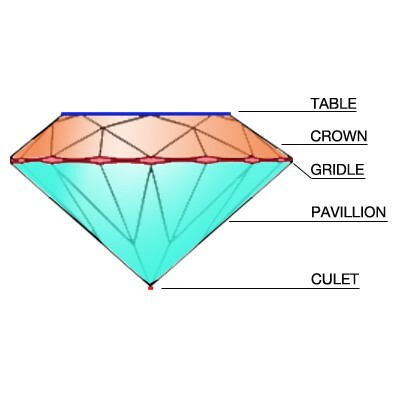 On the other hand, when the diamond is viewed from the bottom (the pavilion), 8 symmetrical hearts should be on view. Only about 1% of the world’s diamonds are true hearts and arrows, with an ideal cut. It is absolutely not necessary for a diamond to display a perfectly symmetrical H&A pattern in order to be classified as an excellent cut, or an excellent overall diamond. The H&A especially in the States has become more of a marketing gimmick pushed by diamond marketers due to the romantic symbolism of the hearts and arrows. Some companies (especially in the States where the H&A is more widely marketed) have even developed gimmick modified cuts where they manipulate the faceting of the diamond in order to create the H&A effect. But, what is important to note is the fact that it is not the actual hearts and arrows that make the diamond brilliant, but rather the brilliant cut that makes the hearts and arrows. If you would like to find out more about the 4 C’s of the diamond (cut, colour, clarity and carat weight) do not hesitate to call us on 01 677 8449 to speak to one of our specialist advisors. This entry was posted in Diamond Education and tagged 4Cs, buying a diamond tips, Hearts & Arrows.